You are here: Home › NEWS › Blog › Is your cubicle house ‘Winter Ready’? Prepare your cubicles, clamps, bolts and mats before you house your animals this year. The most important thing to ensure before housing your animals is to have all your cubicles clean and free from dung and effluent. 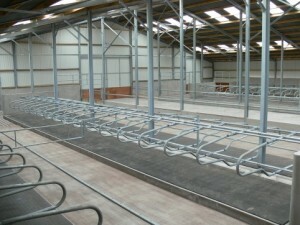 This should be done straight after the animals are left out in the spring to prevent any rust on the galvanised cubicle. Check all your cubicles for any breaks in the clamps. If there are any breaks or damage to the clamps replace them immediately, this is important for the safety of your livestock. Check to see if all clamps are tight and secure before animals are housed to keep cubicles in place. Check the lying surface, including mats. Ensure all mats are washed and checked for damage and replace damaged mats to provide maximum comfort for cows. For any further information on cubicles and mats do not hesitate to call us on 021 7334066 or email us on info@odonovaneng.ie.